All orders on Etsy have an "Expected Ship Date" included in the print out of your order, your order will ship on this date. Need to upgrade to a faster delivery option?, send me a convo to work things out. It's important to double check the model of your Macbook to make sure it will fit perfectly, here's a short reference table to identify your model, to identify your Mac's model, look on the bottom cover, near the hinge in very small letters you will find the model, it starts with "A"
All of our items are hand-made in 10 business Days, Not fast enough? No worries, we can work quicker, see options at checkout for fast turnaround and arrival in 6, 8 and 10 business days. 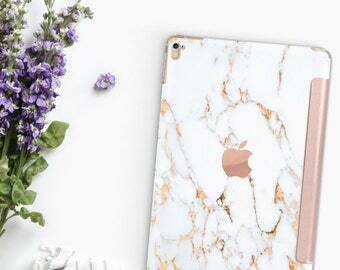 Bianco Sivec Gold Veins Marble Rose Gold Smart Cover Hard Case for iPad 9.7 2018. iPad Pro 12.9 2018 . iPad Pro 11" . iPad Air 10.5"
Looking for the perfect gift?, make it personal with an embossed hand made monogram. 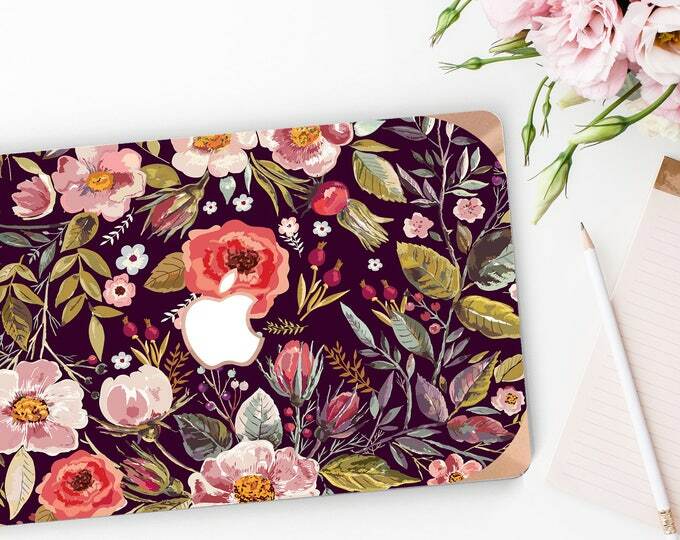 My husband and I have always been very passionate about everything beautiful and at the same time we share a love for Apple products & all things Tecky. We noticed how much time we had our iPhone in our hand and although we love our Apple products, we quickly became bored of the same color tone and at the time there were not a lot of fashionable and stylish cases cover-ups that would help us fell in love with our Gadgets once again. In a way we just wanted to make the product for our selves, we didn't have any graphic design background and taught we were not creative enough to start a business that required a lot of creativity. One night we read a Quote from Rene Brown -- I'm not very creative doesn't work. There is no such thing as creative people and non-creative people. There are only people who use their creativity and people who don't -- This had a huge impact on our decision to start Clique Boutique. We started to learn about Color and emotion and applied this our work at Clique. We believe each of our customer is Unique and deserve a Unique product, we produce every item just for you and do this at the time you place an order, we do not mass produce any of our products. We are proud to say that we product & source all of our materials from local suppliers in USA, all of our designs are handmade. Our premier designs are hand drawn by talented artists that we have the pleasure to work with and that we consider part of our creative team. We hope you enjoy your visit to our store and enjoy our product, please feel free to send us a Convo with any Custom Requests, Ideas, or just to say Hello!, we would love to hear from you. Mother, Wife, Entrepreneur and Maker. My everyday mission, delight customers with amazing artwork, everything else will come as a result of doing it with excellence. 8 Years old, Son, Brother to Abbie, Train Lover. 2 Years old, Daughter, Sister to Christian, Dolls rock! Welcome to Clique Boutique, We are a designer of Stylish, Fabulous & Fashionable Cases & Skins, our products the perfect way to match your gadgets to your personality. Make a Fashion Statement with your Gadgets! Great style is a fashion fusion of confidence, creativity and self-expression. It’s about taking risks and discernibly adopting fashion trends. Fashionable technology accessorize your personal style and enhance your lifestyle, especially for the Fashion Diva who’s part gadget geek. Imagine wearing the same outfit every day, over and over again. It would be fashionably demoralizing. Why would you want to put your iPhone through that same oppression? With the right look, your iPad & Macbook, can be an outfit accessory. Our cases and skins are more than just a protective covering. It’s the stonewashed denim vest to your floral dress. The perfect black legging to your denim chambray. Make fashion statement with your Gadgets. We believe each of our customer is Unique and deserve a Unique product, we make every item just for you and do this at the time you place an order, we do not mass produce any of our products. We are proud to say that we product & source all of our materials from local suppliers in USA, all of our designs are handmade. Our premier designs are hand drawn by talented artists that we have the pleasure to work with and that we consider part of our creative team. We hope you enjoy your visit to our store, please feel free to Contact Us with any Custom Requests, Ideas, or just to say Hello!, we would love to hear from you.